Decided to stay local once again today and ended up starting my trawl of the area at Napton Reservoir. As you can imagine the water remains high but there's still plenty of reeds showing above the water line and several Sedge Warblers could be heard singing away. A few nesting birds were located with Coot and Great-crested Grebe both sitting. Plenty of Swift feeding overhead and the adjacent fields were awash with juvenile Starlings, which seem to be having a bumper year. As things begin to quieten down there were still a few birds in song and these included Willow Warbler and a couple of Chiffchaff, the latter probably on their second brood. Spotted Flycatcher today along the Grand Union Canal. From the reservoir I drove to a few locations in search of Spotted Flycatchers and this produced my first UK birds of the year, with three in total. At Flecknoe I decided to take a long walk along the Grand Union Canal towards Braunston. The towpath has recently been cut and I'm happy to say that plenty of set aside on the waters edge has been left. Unfortunately the dull conditions prevented any decent numbers of butterflies or odanata and the best I managed was Large White and Orange-tip. 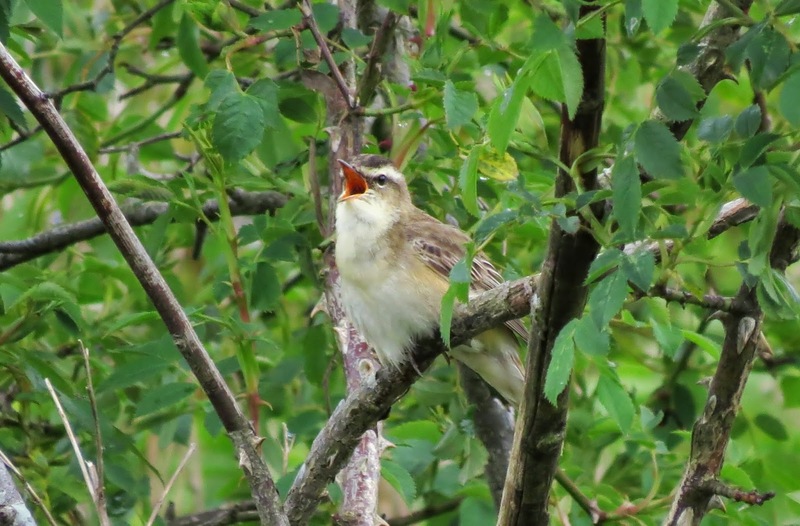 Sedge Warbler in full song! A couple of Yellow Wagtail near bridge 100 while I was having my packed lunch and plenty of Linnet, Yellowhammer and airborne Skylarks. A walk inland from the canal near the LNER disused railway line produced a couple of Grey Partridge along the tracks. Over the last few years this walk has been known to produced the odd Turtle Dove but sadly despite an hour or so looking none were located or heard today. Back at the marina the usual Buzzards were enjoying a thermal, at least two Lesser Whitethroat are holding territory and a couple of Common Terns have been regular visitors over the last few weeks. A Hobby passed through in the late afternoon and an additional Tern Sp. which flew high overhead shortly after I'd returned from taking on fuel, may well have been an Arctic! Being a keen butterfly enthusiast Alan Lunn one of the Brandon Marsh team had mentioned spending a few hours at Stockton Cutting Nature Reserve and with the weather forecast predicting a glorious morning we met at 10 O'clock at the Boat Inn. The area itself is a deep sided disused railway cutting through lias limestone clay's, with adjacent spoil banks and a small abandoned quarry, excellent habitat for butterflies and odanata. Almost upon arrival we were into a selection of butterflies and these included: Small Blue, Common Blue, Dingy Skipper, Grizzled Skipper, Brown Argos, and decent numbers of Brimstone. To complete a really enjoyable few hours we were joined by Bob and Richard who'd given up on Draycote Water for the day. We spent the rest of the visit chasing down Hairy dragonflies but unfortunately never managed to connect with Green Hairstreak butterfly, one of my targets for the day. A few more additions with Beautiful Demoiselle, Banded Demoiselle, White-legged and Blue-tailed damselfly and Orange-tip butterfly! Arrived at Brandon Marsh this morning just as the rain was subsiding and made a quick dash to the East Marsh Hide to see if anything decent had been brought down. On Willow Island a summer plumage Dunlin was located quickly followed by a Common Sandpiper but nothing too exciting. The four adult Oystercatchers were busy with their families of two and three respectively, in fact it's looking as though these remaining five may just make it. A little later in the morning a single Ringed Plover and a brace of Little-ringed Plover dropped in and these along with four Redshank produced a reasonable wader count. Also of note: Cetti's Warbler (3 heard), Garden Warbler (3), Shelduck (4), Common Tern (7) and an unprecedented count of 22 Mute Swans. A pair of mating Cuckoos near the 'Tip' area was a surprise mid morning, and not just for the male of the pair, as the female bird turned out to be of the rufous morph type. This accompanied by a second grey female later over on the top reedbed confirmed my thoughts of at least two pairs at Brandon. River Meadow produced a few butterflies and these included: Small Tortoiseshell, Green-vein White, Orange-tip, Common Blue, Peacock and Small Copper. Also of note Banded Demoiselle, Common Blue, Large Red and Azure Damselfly. On the Farm Pool reeds a Grasshopper Warbler was reeling and at one stage a Sparrowhawk flew through scattering several Reed Buntings. Lunch in East Marsh Hide with Jim produced a fly-by Red Kite, when a single bird approached from the east before crossing Newlands and heading off. This followed by a visit to the Carlton Hide and screen area and my first Hobby of the year, with two birds quartering low over the reedbed. Finally a walk past the memorial garden was a bit scary, when a swarm of Honey Bee's I'd been monitoring over the last week had finally attached themselves to a nearby tree! Visits to Brandon Marsh Thursday, Friday and Sunday produced few surprises on the birding front and I was unlucky to miss a Sanderling on East Marsh Pool today, which was reported shortly after I'd left. Friday produced (3) Grass Snake, my first Large White butterfly of the year and excellent views of a ♀Cuckoo, bubbling away as she flew over Newlands reed bed. I estimate at least two pair are currently on site. On arrival this morning a Grasshopper Warbler was reeling on the top reeds as I drove down to the car park. When I eventually got to East Marsh Hide I was sad to hear that the four Redshank young, which I thought had been doing so well, had unfortunately been predated. With the birding generally quiet the rest of the morning was spent with a few of the guys messing around with our bridge cameras: Common Blue and Large Red Damselflies were plentiful, along with a couple of Drinker Moth caterpillars. Butterflies included Orange-tip, Brimstone, Peacock and Green-vein White. This afternoon Dee and I had a stroll locally around Stockton Cutting Nature Reserve, strangely enough somewhere we've never tried, even though it's right on our doorstep. Here we met up with Bob Hazell and his wife, does he ever go anywhere without his scope! After a catch up with Bob we had a cracking visit with some excellent butterflies including: Small Blue, Common Blue, Speckled Wood, Brimstone, Dingy Skipper, Grizzled Skipper and Large White. A couple of Hairy dragonfly ended an enjoyable visit. Also worth noting that while writing my post this evening a Barn Owl flew directly over the boat calling, amazingly my first local bird of the year! Please be vigilant if your visiting the reserve in the evening over coming weeks! It's frightening to report that three teenage males were chased off of the reserve last Wednesday evening at approximately 18:00 hrs attempting to light a fire on the top reed bed. This was along the grass strip north of the top reed bed, parallel to Brandon Lane. Luckily a member of the Warwickshire Wildlife Trust's staff chased them off, extinguished the fire and then followed after them as they disappeared over the railway bridge towards Brandon woods. The staff member verbally warned them from a distance which hopefully will see they do not return. I'm sure everyone is aware of what devastation this could cause, particularly at this time of year! If anyone see's any suspicious activity at the reserve we ask that you report it to the police on the non emergency number 101. Your help would be much appreciated. A welcome return to Brandon Marsh this morning and no sooner had I turned into the lane than the heavens opened. With the rain turning even heavier I decided to make a quick dash to the East Marsh Hide, forgoing my usual migrant hunt around the farm and top reedbeds. Amazingly, almost the first bird of the day turned out to be a Wood Sandpiper, when immediately after opening the hide flaps one dropped onto Willow Island. There was no point venturing from the hide so I decided to concentrate my efforts this morning on the pools. Firstly, in the hope that the heavy downpours might drop more migrants in, but also to catch up with the news when the Tuesday mob arrived. During the morning I managed a decent count of waders with: (3) Little-ringed Plover, (4) Ringed Plover, 2 pair of Redshank including (4) young and 2 pair of Oystercatcher with (3) and (4) young respectively. In addition at least (3) Lapwing chicks were on Tern Island. Common Tern numbered (3) on and around the rafts and an excellent count of (5) Shelduck, with birds taking a great interest in one our man-made nesting holes! A couple of Yellow Wagtail also settled for a brief stay. The rain turned to heavy showers mid morning so we took a walk to the screen area and Carlton Hide in between. 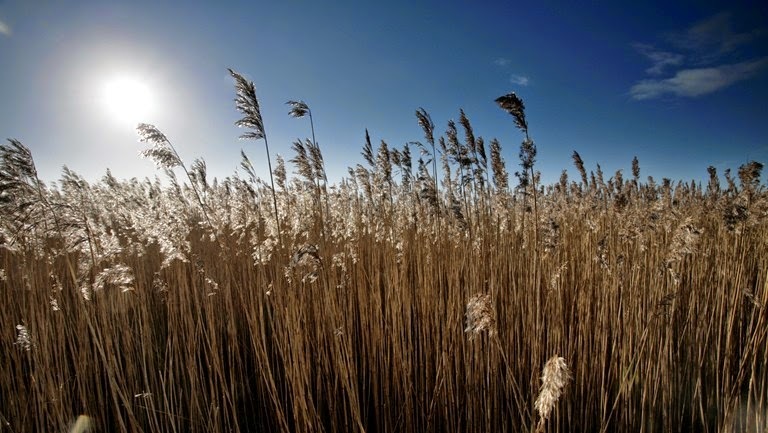 It's great to hear the reedbeds, bramble and hawthorn alive with birdsong: Sedge Warbler, Reed Warbler, Common Whitethroat, Blackcap, Willow Warbler, Chiffchaff and Garden Warbler all noted. After one particular downpour there seemed to be a sudden influx of Cardinal Beetle, with many on the nettles and I also managed to try out the macro with the Canon SX on a Banded Demoiselle, which rested long enough to get close up. I eventually managed a tour of the farm and top reedbed area without any rain interruption after lunch. As I passed Willow Wood the call of a Red-legged Partridge from inside came as a surprise. At one stage a Cuckoo was calling and perched briefly on one of the dead tree's before moving off. With the sun shining and the heat building a few butterflies took to the wing and Small Copper, Comma, Orange-tip, Green-vein White and Brimstone were recorded. A Drinker Moth caterpillar was also discovered near the 'Olive Seat'. I took my final pre breakfast walk around the Can Cullerassa this morning in the hope of finding a few more additions to our Majorca list. As it happens I was delighted to come across my first Red-footed Falcon of the holiday. A bird on the wires across the marsh spent the whole time I was on site preening, suggesting that this may well have been a new arrival. I was also pleased to finally get a photograph of Great Reed Warbler, when one eventually sat up for an albeit brief encounter. Salobrar de Campos is the second largest wetland in Majorca. 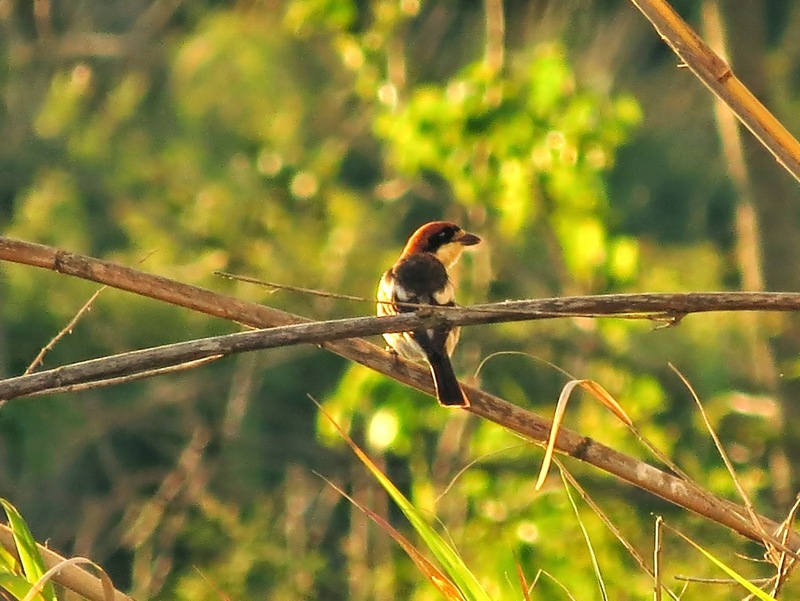 With a surface area of more the 300 hectares, it is a true haven for birds. A good part of the area is operated by a salt extraction company and access is restricted. However, there are two tracks open to the public and today Dee and I spent our final day on the Island exploring. There are shallow lagoons to the left of the track with varying water levels and to the right it appears that what was once lagoons are now devoid of water. Redshank, Little-ringed Plover and Kentish Plover were noted but almost immediately two birds overhead turned out to be Collared Pratincole. Shelduck were in good numbers along with Black-winged Stilt and of course being saline waters Avocet were also plentiful. The vegetation alongside the pools is typical of a brackish habitat: Tamarisk, saltworts, sea-lavenders etc. attracting several Stonechat along with many Yellow Wagtails and both were collecting food for youngsters. Several Marsh Harrier were busy quartering the area, along with a single Kestrel. Dee's image of one of the many Greater Flamingo. Halfway along the track we met a couple of local expat birders, who initially thought I was German, make what you will of that. These guys were very friendly and their local knowledge was greatly appreciated, in fact Dee and I spent the rest of our walk in their company. Greenshank, Green Sandpiper and Ruff as we continued on, plus a distant Booted Eagle and an incredible count of 61 Greater Flamingo! On the return journey Stone Curlew, Thekla Lark and Tawny Pipit before we parted company. As a point of interest I did inquire as to whether this had been a decent spring migration on Majorca, having fallen a little short of a few species I'd have expected to come across. I was told that the migration of 2013 was an excellent year and that this year had been quite disappointing, seems the weather of 2013 was more unsettled and thus downing more migrating species, whereas this year the good weather had probably helped birds move straight through! Before heading off for lunch we took the short drive to the opposite side of the salt-pans stopping on occasions to scan. Here we managed to pick up a few additions with: Curlew Sandpiper, Spotted Redshank, Ringed Plover and Red Kite, which drifted across from the seashore. Alpine Swift at Santueri Castle and you can just make out the moon. After lunch at Colonia Sant Jordi we drove to Santueri Castle, Felanitx, where thanks to a tip from our birding expats we delighted in not only the views from 475 Meters above sea level but the dozen or so Alpine Swift which reside there. A cracking end to our holiday which also included Blue Rock Thrush, Booted Eagle and Raven up at the castle. Finally, during our stay in Majorca the use of Dave Gosney's 'Finding Birds in Majorca' book and DVD and 'A Birding Tourist's Guide to Majorca' written by local birders have proved invaluable. I've also used several extracts from their literature in relation to the sites visited during my updates and I'm thankful. I would highly recommend both books if your planning a visit to Majorca any time soon. There seem to be a few more Terns arriving around the locality so at first light I took the short trip to an area just inland from the Torrent de Albufereta, where we'd noted a couple of Common Terns from the roadside the previous evening. There are a few pools that are viewable from a small raised area and on my last visit Stone Curlew were quite prominent. Once again the Stone Curlew were located along with Yellow Wagtail and Stonechat, the pool did indeed have a couple of Common Tern, along with Red-crested Pochard, Cattle Egret, plus nesting Kentish Plover and Black-winged Stilt. A Marsh Harrier also drifted over during my visit and Serin, Goldfinch, and Greenfinch were seen in the pine wood that leads to the pools. Cetti's Warbler - distant but at least we could see him! Later in the morning we headed off for Cap Capdepera, the most easterly site on Majorca, around 30 or so miles from our villa. Firstly, we decided to stop off at an area known as Tucan Marsh. This is a small wetland hemmed in by development between Alcudia old town and the Alcudia resort and accessible by a small track near the Lidl store. In fact despite its location it proved quite fruitful during our visit. A Great Reed Warbler, Cetti's Warbler and Nightingale were singing close by and the pools held Little Grebe, Great-crested Grebe and a summer plumage Black-necked Grebe. A real treat was while Dee and I were scanning the surrounding reedbeds, locating a Little Bittern, which offered good views as it flew across the far end of the pool. Audouin Gull and Yellow-legged Gull were also recorded before moving on. The view down to the sea from Cap Capdepera. At Cap Capdepera we parked at the lighthouse and took a stroll through the small copse near to the housing area before continuing on over the rocks for a sea-watch. The wooded area held Sardinian Warbler, Stonechat and we inadvertently flushed a trio of Turtle Dove. On the rocks themselves another trio, this time Wheatear plus a single Blue Rock Thrush before we settled for a half hour. There were a few Mediterranean Shag on the rocks below and during our stay eleven Cory's Shearwater and two Balearic Shearwater passed through. Huge Eagle SP. Over the Albufera showing seven fingers. A stop at Depuradora de S'Illiot observation platform on route home, which offers panoramic views across the area was a haven for young Shelduck, which delighted Dee. Several Marsh Harrier were quartering and fly pasts of Booted Eagle, Eleanora's Falcon and Squacco Heron. A huge Eagle SP. at least twice the size of Booted and showing seven fingers flew through at distance, someone even called out Golden Eagle but the photo Dee managed and the little time for observing before the bird flew on is inconclusive for me on ID. Waders included Common Sandpiper, Little-ringed Plover and nesting Black-winged stilt. At one stage at least 20+ Bee-eaters were up high soaring in a thermal offering an unforgettable moment. A second visit to S'Albufera and this time an early start: well early for Dee that is! In fact we arrived shortly after 9am but today we'd decided to give the information centre and hides a miss and take the track that leads south overlooking both Es Ras and Ses Puntes marshes. There are also a couple of raised towers along this stretch too with good all around views of the reserve. Best I've managed thus far of Eleanora's Falcon. It wasn't long before the first of several sightings of Eleanora's Falcon but not since arriving here have we had one come particularly low, so photographing them has been a real challenge. The usual Little Egret and Cattle Egret were constantly overhead and at least a half dozen Marsh Harrier, including a particularly nice looking male, were quartering the reserve. The reedbeds I have to say were almost devoid of song, maybe we're here a little too late for some species, but at least one Moustached Warbler was heard singing. Cetti's Warbler and Fantail Warbler are a constant all over the Island and only a single Great Reed Warbler was recorded during our walk. The highlight of the day occurred when Dee and I were walking back towards the centre, when suddenly a Little Bittern flew out of the reeds and along the path in front of us before disappearing back into the reedbed, priceless. Other species of note: Purple Heron, Purple Swamphen, Red-crested Pochard, Water Rail, Peregrine, Hoopoe and Night Heron. After registering our visit back at the information centre we left and took the short drive to the old saltpans (Ses Salinetes).This is a water treatment plant which has a couple of fresh water lagoons and after investigating these there is a walk that leads down to Son Bosc. We parked at the sign saying S'Illiot and in fact had only just reached the first lagoon when a couple of Marbled Duck came into view. A single Avocet was noted along with Black-winged Stilt, Common Sandpiper and Little-ringed Plover. 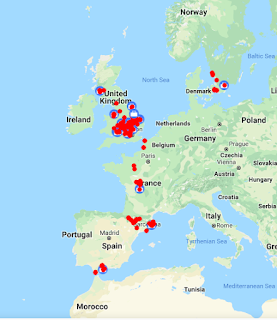 Surprisingly, despite visiting many pools and marshes throughout our stay, not a single Whiskered Tern or Gull-billed Tern has been recorded, in fact only three Common Terns have been seen throughout! From the pools we walked the track along to Son Bosc for around 500 mtrs. Here Woodchat Shrike, Great Reed-Warbler and at one stage we were almost on top of a singing Moustached Warbler and still didn't connect. 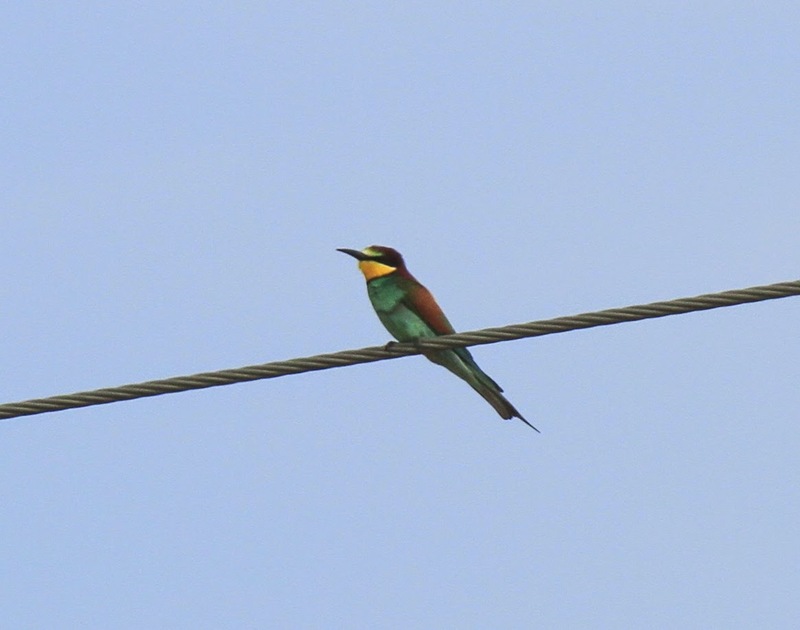 At the bottom of the track several Bee-eater were on the wires and a single Short-toed Lark before the return journey. I made an early start to my day and headed up to the Formentor Peninsula and in particular the Abercutx Watchtower, a place that offers stunning views of Pollenca Bay and back towards the Tramuntana Mountains. Renown as a good place for raptor watching during migration I spent an hour or more in the company of a French birder, the only other person during my stay. Unfortunately our vigil drew a complete blank on raptors but we enjoyed trying to get a decent view of a Balearic Warbler that was flitting around in the scrub below. Pallid Swift, Common Whitethroat, Spotted Flycatcher, Blue Rock Thrush, Red-legged Partridge and several Bee-eaters passed through before I headed down. A stop at the mirador car park at the bottom of the road gave an opportunity to look down on the sea and produced a few Cory’s Shearwater passing through but not the hoped for Eleonora’s Falcon! I’d heard varying reports regarding Son Real with the boast that that this is the best place to see Dartford Warbler and Balearic Warblers, so Dee and I gave it a go. Firstly, I’d have to say that this is a really beautiful walk that leads from the farm buildings some 100 Meters in off the main road, through pines and then down to the sea shore. I’d also read that the 2 km walk down to the shore was mostly unproductive, but for birders like Dee and I who just enjoy birds and don’t need rarities popping out everywhere it was superb. You surely can’t complain when you have Cirl Bunting, Serin, Nightingale, Pied Flycatcher, Spotted Flycatcher, Stonechat, Turtle Dove, Wood Warbler, Red-legged Partridge and yes, even a single Balearic Warbler! Down on the beach some excellent opportunities to watch one of my favourite gulls, the Audouins Gull. Hard to believe that in the late 60’s this was one of the worlds rarest, so kudos to those who made a sterling effort in the reintroduction of these beautiful birds. Kentish Plover, Shag, Kestrel, Yellow-legged Gull and a fly-by Booted Eagle were other species of note and as for Dartford Warbler; there wasn't a single one to be found during our visit! I took an early start before Dee and Dave were up and about near the Torrent de Albufereta and on arrival inadvertently flushed several Cattle Egret feeding in the shallows. My target this morning was to try and get a photographic record of one of the several Stone Curlew that have been constantly flitting around the area. Thankfully my thoughts on where they were roosting paid off. Around Can Cullerassa no real additions to any of the species mentioned in my previous entries but another Eleanora's Falcon overhead, Marsh Harrier and a huge fall of House Martin overnight, with hundreds feeding over the plains and pools. After dropping Dave at Palma airport for his flight back to Malaga Dee and I detoured to Cap Blanc, a short drive from the airport. 'Marina' is the Majorcan name for the flat low-lying areas occupied by a mix of pine woods, wild olive, heather maquis and un-vegetated land. Cap Blanc is possibly the finest example there is and captures the essence of this Islands ecosystem. The cliffs overlooking the sea are well conserved and offers a great sea watching area from the lighthouse. As you reach the lighthouse you can hop the low wall and explore the area in more detail. Within minutes of our arrival Balearic Warbler could be heard and was seen briefly, in fact three brief sightings during our stay. This is also an excellent area for Tawny Pipit and Thekla Lark, both recorded during our visit. As we moved west along the cliff top an Osprey drifted over and shortly after a Peregrine made an appearance. Blue Rock Thrush from Dee on the Canon SX50 - Does anyone want my Canon 7D!! Wheatear, Stonechat and Sardinian Warbler are numerous and there's always a chance of Blue Rock Thrush, which duly obliged! Other notables during our visit included: Red-legged Partridge, Turtle Dove, Nightingale, Spotted Flycatcher, Firecrest, Serin and Linnet. The sea was particularly quiet with no passage birds during a brief sea-watch, probable due to the time of visit (midday) but Shag, Audouins Gull and Yellow-legged Gull were noted. Booted Eagle in the afternoon sun! Finally, as we were leaving a Booted Eagle flew through offering a chance to fire up my 7D and ending a really enjoyable visit. Saturday we decided to take a walk around the Cuber Reservoir. This large body of water is situated within the Tramuntana mountains and is apparently an excellent area for raptors and a selection of rarer warblers, such as Spectacled and Moltoni's Subalpine Warbler. Sorry! But under duress Dee insisted I put this picture on! After carving out a parking space, the three car parks were all full, Wryneck and Firecrest could be heard calling but unfortunately in an inaccessible area across from the reserve. After entering the main path we began by searching the area near to the helipad, which is apparently a good place to find Tawny Pipit but sadly drew a blank. Lots of Yellow-legged Gulls on the water, up in the mountains and on the wing, which to be honest can be a hindrance when searching for raptors. Spotted Flycatcher were abundant during our visit, with literally one every 100 yrds or so. Distant record shot one one of two Griffin Vultures seen during our visit. The pined areas leading up to the dam itself produced only Chaffinch and Sardinian Warbler and along the waters edge a single Wheatear and a couple of Little-ringed Plover were recorded. We paused for a while atop the dam looking down to the valley which lies below, here Wryneck, Nightingale and a pair of Blackcap. 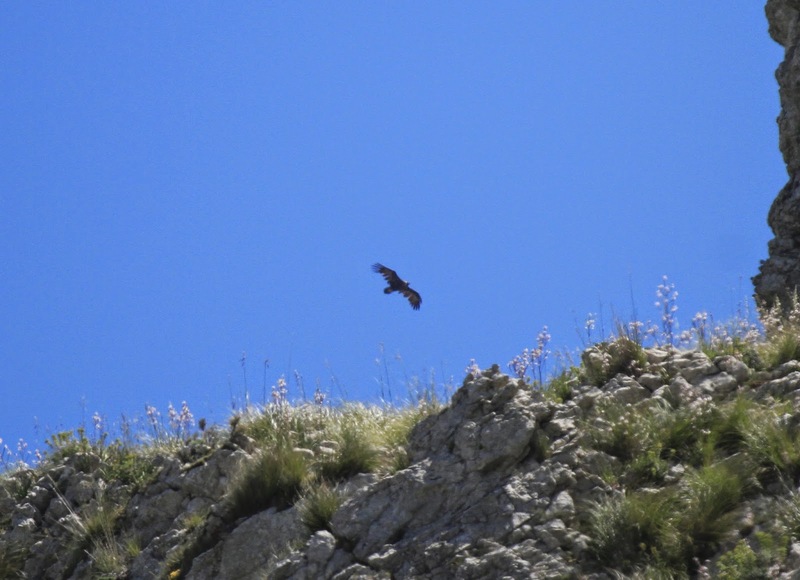 Although the site is recognised as a good raptor area, some references offering at least ten species in a day, we managed just two, Red Kite and Griffin Vulture. So I would certainly have to say that we must have completed the superbly panoramic 4.5 km walk around the reservoir on a really disappointing birding day! Dee's search was very fruitful! Dee was a little more successful in here search for her favourite mammals and reptiles, when she came across a couple of Viperine snakes in the shallows! Sóller to Palma Day Off! A day off intense birding today and a trip on the Sóller to Palma railway, which having completed it I would highly recommend to anyone visiting the Island. We decided to complete the journey in reverse and boarded at Sóller, rather than brave the traffic of Palma. In fact the town itself is certainly well worth a visit. The historic electric train takes a route south across the plains, winding through mountains and 13 tunnels of the Serra de Tramuntana, finally ending at the railway station at Palma. Work began on the railway in 1911 on the profits of the orange and lemon trade, which at the time was booming. For this reason, it is sometimes known as the Orange Express. The famous train is now only a mode of transport between these two key Mallorcan settlements, but also an attraction in itself. From a birding perspective, several Red Kites, Peregrine, Marsh Harrier and Kestrel were the highlights. Just prior to sunset I took a delightful walk along the track which leads away from the villa and left Dee and Dave to unwind around the pool! On the ploughed field a couple of Red-legged Partridge were foraging in the open and two Turtle Dove were seen enjoying the evening sunshine. In the adjacent fields Stone Curlew were calling once again but I never managed to connect. Lots of Barn Swallow were feeding low but I'm still to register my first Red-rumped. A lovely ♂Whinchat, along with several Stonechat and Sardinian Warbler on the surrounding fences and Nightingale and Corn Bunting were in full song. Finally, before heading back a Woodchat Shrike came down onto the ground, before perching on a nearby bamboo for a quick photo before heading off. A quick look at the ploughed fields to the rear of the villa at sunrise produced a gorgeous ♂Whinchat and an unmistakable purring call alerted me to my first Turtle Dove of the visit, perched across on the phone wires. Although Stone Curlew had been calling while I was enjoying my coffee before leaving the villa, there was no sign of last nights birds. A five minute drive and my now regular morning walk at Can Cullerassa provided a few new additions to my local list with Spotted Flycatcher, Night Heron and Purple Heron. After breakfast Dee, Dave and I headed for S'Albufera, probably one of the best known and internationally recognised natural areas in Majorca, around a 15-minute drive from the villa. Although it was quite busy it wasn't as bad as I'd feared, this being a mayday bank holiday on the Island. 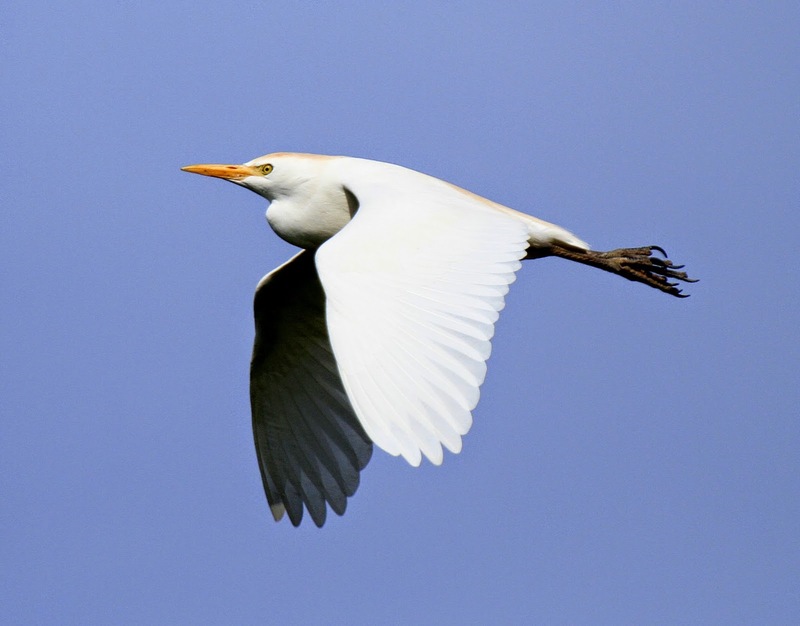 First birds of note were Cattle Egret and Little Egret, along with a single Night Heron in the trees overhanging the channel that leads along the 1.2 km walk to the visitor centre. 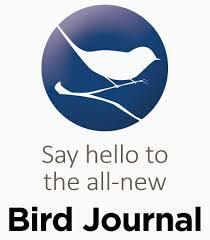 A singing Great Reed Warbler was also heard along the boardwalk that leads up to the centre. In fairness to Dee and Dave I only made them complete the walk from the centre along to the Es Colombars Hide and back (information and reserve map HERE) but we ended up with quite an impressive tally and Dee and I will complete other areas next week, hopefully a little earlier in the day! Pausing at the bridge which overlooks the main channel Red-knobbed Coot, Purple Swamphen and several Red-crested Pochard. Overhead the cracking sight of Eleanora's Falcon and Osprey was one of the holiday highlights for me thus far! Apparently the bridge is also a good place to see Little Bittern too but sadly not during our visit. Kentish Plover - One of many today. Further up the track there are several places to overlook the reserve, including a designated raised platform area. From here the brief song of Moustached Warbler rang out from the reedbed but we never managed to connect. A Marsh Harrier was quartering in the distance and a flyover of Purple Heron, Peregrine and once again Eleanora's Falcon. The pools held Kentish Plover, Ringed Plover, Little-ringed Plover, Wood Sandpiper and Black-winged Stilt. The Es Colombars Hide, which overlooks pools near to the power station was relatively quiet with a couple of Redshank, Great-crested Grebe, Little Grebe and I was surprised to still see several very pristine ♂Pochard, plus a pair of Shoveler. The main highlight was a Water Rail, one of Dee's nemesis birds, which thankfully showed very well for her during our stay. Finally, a stop at the hides overlooking the Es Cibollar Pools, which offer close range views of a number of species provided an excellent wader count with: Greenshank, Spotted Redshank, Wood Sandpiper, Curlew Sandpiper, Dunlin, Little Stint, and a couple of Temminck's Stint to end the day.